Jack Black in "Year One"
It’s hard to believe that a silly playground-type game like Freeze could trigger a future acting career for anyone. Then again, Jack Black isn’t like anyone you’ve ever met. Born and raised in Hermosa Beach, California, Jack (whose real name is actually Thomas Black) joined the ranks of Tim Robbins’ comedy troupe while attending UCLA. Following graduation, Jack participated and landed in several small roles in films like “Demolition Man,” “The Cable Guy,” and “The Jackal” before finally breaking out as a brilliant character actor in the John Cusack comedy, “High Fidelity.” More roles followed, and after finally paying his due, he was finally rewarded with a movie of his own. “Shallow Hal” was hardly a cinematic achievement for Jack, but it proved that he could carry a movie on his own, and two years later, he had us all rolling on the floor with laughter in the Richard Linklater-directed “School of Rock.” Jack was officially a movie star, but his next two films (“Envy” and “Shark Tale”) proved to be critical flops. Then, in 2004, Peter Jackson announced his remake of the classic film, “King Kong,” and when audiences noticed Jack’s name at the top the cast list, the reservations came fast and furious. The comedian proved critics wrong yet again, however, with a brilliant performance as Carl Denham, and after the movie topped the 2005 holiday box office, Jack was back on track as one of Hollywood’s most promising comedic talents. 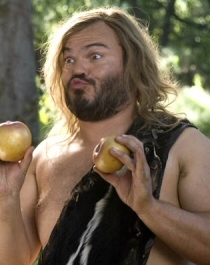 Get the latest on Jack by following our Jack Black tag. An online database of Jack's film career. Believe it or not, Jack Black has been acting for more than a decade now - with small parts in "The X-Files" and films like "Dead Man Walking" and "The Cable Guy" - but you'd hardly know it. The comic actor didn't really start to make a name for himself until he stole the show in "High Fidelity," and again in the guilty pleasure "Saving Silverman." Since then, Jack has made his own luck with hilarious starring turns in "Orange County" and "The School of Rock," and even proved that he could handle a dramatic role in his most recent film, "King Kong."